The possibilities for human enhancement stem from new scientific and technological innovations. And even though many Americans have reservations about the potential use of cutting-edge biomedical developments considered in earlier chapters, large shares say they think of science and technology, writ large, as mostly beneficial forces in American society. 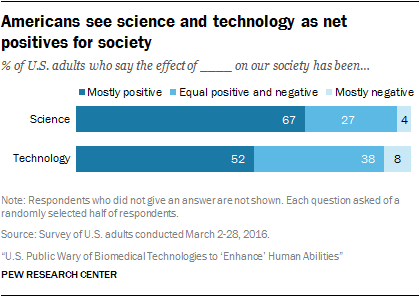 Two-thirds of U.S. adults (67%) say science has had mostly positive effects on society, while 27% say there have been roughly equal positive and negative effects and just 4% say the effects have been largely negative. This finding is in line with a 2014 Pew Research Center study and others showing generally positive views about the effect of science on society. 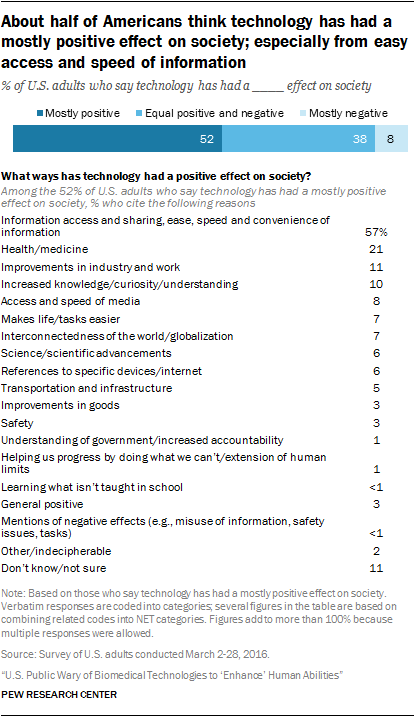 Overall, views about the effects of technology are also largely positive, if a bit less so in comparison with science. About half of adults (52%) say technology has had mostly positive effects, compared with 38% who say there have been an equal mix of positive and negative effects of technology. Just 8% say technology has had mostly negative effects. The survey asked an open-ended question to give respondents a chance to explain, in their own words, why they feel the way they do about science’s effect on society. 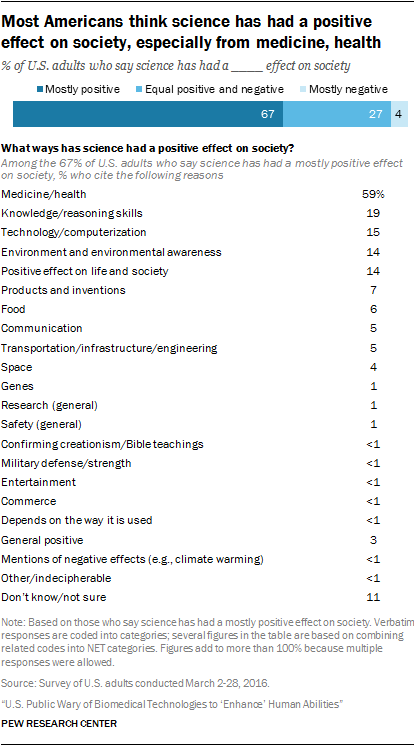 Some 67% of Americans say science has had a mostly positive effect on society; the most common reasons cited are related to medicine and health (59% of this group), including improvements in medical research, quality and longevity of life, and treatment of disease. Other ways science is seen to benefit society include overall knowledge and reasoning skills (19%), technology improvements (15%) and environmental benefits and awareness about environmental issues (14%). Just 4% of adults say the effect of science has been primarily negative. This group of 60 survey respondents is not large enough to analyze separately. Overall, 52% of U.S. adults say the effect of technology has been largely positive. Within this group, 57% cite the vast network of information and communication that is available, easily accessed and shared across the world as a benefit for society. Another 21% see improvements to health, medicine and medical research as benefits of technology. Other ways technology is seen to have a positive effect on society include increased knowledge and understanding, improvements in industry and jobs and an interconnectedness of the world as a result of globalization. 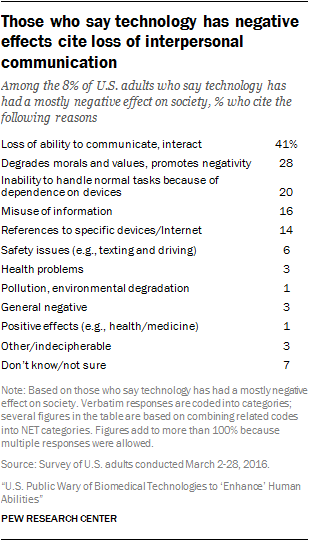 Just 8% of Americans say technology has mostly had negative effects on society. The leading reason for this perspective is the feeling that technology has led to a breakdown of communication and human interaction (41% of this group). Another 28% say technology has degraded society’s morals and values, leading to a reliance on instant gratification and promoting negativity. Others complain that technology has led to an inability to handle normal tasks (20%) or to the misuse of widely available information (16%).